Throughout their 45 year history, Harvey & Brockless have always retained one central philosophy; an absolute dedication to honest, authentic & remarkable food. Since November 2015, we have been working closely with client Harvey & Brockless to create a completely comprehensive and detailed guide to the vast catalogue of artisan cheeses they have to offer. Alongside renowned photographer Sarah Maingot and food stylist Polly Webb-Wilson, we have created an extensive 90 page brochure, showcasing the stunning cheeses and the fantastic producers who create them. The respect and care that goes into the creation of each cheese in this guide inspired us to show the same attention to detail when it came to capturing the cheeses on camera. The painterly aesthetic of the images brings to mind old masterpieces, with scenes of bountiful feasts and moments of calm and balance. The earthy, tonal palette used throughout acted as a complimentary backdrop to the rich, vibrant colours of the cheeses. 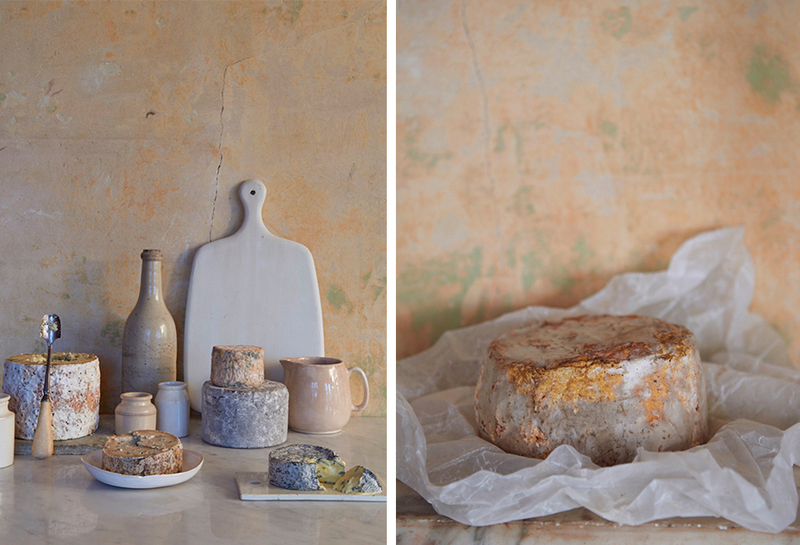 With natural, wooden props used to create a soft, rural atmosphere, the images celebrate the heritage and history behind the cheeses and their producers. The cheeses throughout the guide to artisan cheese are aesthetically beautiful, varying from large, hulking truckles of cheddar, through to delicate, miniature pyramids of goats cheese. This intrinsically means that the many ways in which they are prepared varies just as much as their sizes. We enlisted the help of noted artist Kate Lowe, who created a stunning illustrated guide to the cheese cuts featured throughout the guide. What started out as a simple product brochure quickly evolved into a comprehensive, illustrative guide to the enchanting world of cheeses, where they are produced, and profiles on the passionate people who create and produce them. The respect and care which goes into the production of each cheese inspired the overall tone of the brochure, especially when it came to capturing the cheeses on camera. The earthy, tonal palette used throughout acted as a complimentary backdrop to the cheeses. With props used to create a soft, rural atmosphere, the images celebrate the heritage and history behind the cheeses and their producers. We commissioned photographer Sarah Maingot and stylist Polly Webb-Wilson to transform our concept into the visual feast portrayed across the pages.